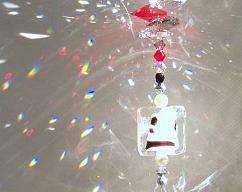 This sun catcher was created because of the beautiful Flower colors the Pineapples and the fabulous Beaches of Hawaii!! 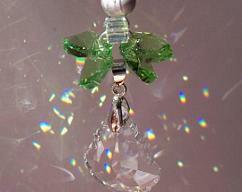 For the Flower colors I've selected 10mm Swarovski Heart crystals in Fuchsia, Rose, Lt. Rose, Indian Pink, Topaz and Lt. Topaz along with 14mm Swarovski Leaf crystals in Peridot and Fern Green. Topping these Heart crystals I've attached a sweet 10mm Swarovski Butterfly crystal in Provence Lavender-Chrysolite Blend along with 5mm Swarovski Bicone crystals in Rose, Fuchsia and Indian Rose. These crystals are all strung on a Silver-Plated Flat Oval Cable Chain and nylon coated beading wire. 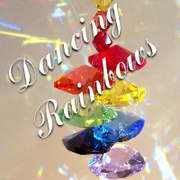 All the colorful crystals of this unique suncatcher adorn an exquisite 28mm Swarovski Strass Seashell crystal which bears the Strass logo. I have attached a whimsical silver-toned enameled Pineapple charm. 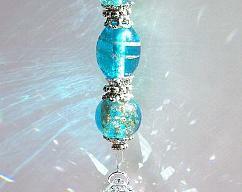 The bead area of this charming sun catcher measures 5 1/2" and the entire length including the plated hanging ring measures 6 3/4". Materials used: swarovski and swarovski strass crystals silver plated chain and components enamel charm and nylon coated stringing wire.